This is one of the most easily customizable themes I have purchased, and the support is really responsive. I’m very happy with the theme, and pleased that it doesn’t have too many bells and whistles to slow it down. Support is amazing, this theme does exactly what I want it to. Molitor puts a lot of time and effort into his theme and it really shows. Quality all around and great support on his forum. Many themes I’ve bought over the years end up all but abandoned, not so with this theme. Always up to date and theMOLITOR has added some much longed for features along the way! I have been using your theme for over a year now and I must say it is incredible! Great customer service and great theme all around! Highly recommend not only the template but the designer. Outstanding design! 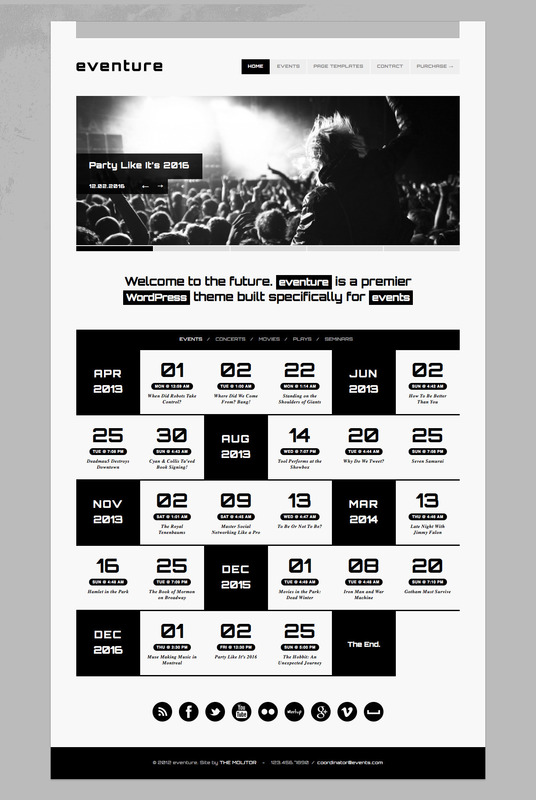 Love the approach to an events website! Works like a charm. Very flexible code. Thank you again for this gr8 template. This theme really is the business, great set up instructions. The theme itself is very useful, has increased community engagement, and the customer support I have received when problems arise has been superb. Would recommend anything by this author. * Improved slider post order and made expired posts hidden. * Improved sub menu style for mobile layout. * Fixed: issue with white screen after submitting an event. * fixes search bug and the post title/header image in mobile layout. 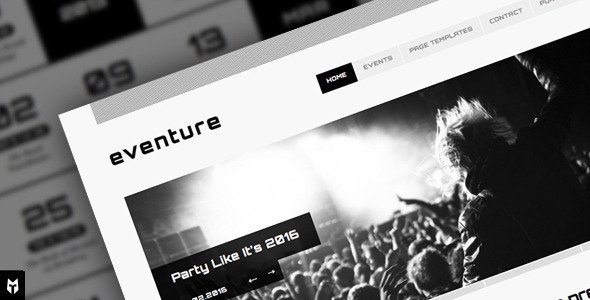 * Added WP Theme Customizer support (replaces OptionTree theme options panel). * Fixed calendar filter issue with letter accents and multiple words. * Updated theme options panel. * Fixed future post publishing issue with WP 3.5. * Updated theme options panel appearance and updated/added support tab. * update addresses issue with categories that contain two words (i.e. "Some Category"). Words can’t express how satisfied I am not just with this theme, but the support… Looks exactly like a professional movie site should. My production has a very high standard and it was crucial the website reflected that standard. Thank you Chris!! !